(CNN) -- President Mahmoud Ahmadinejad ordered Iran's atomic chief on Sunday to enrich the country's uranium to 20 percent. The move is seen as a fresh challenge to Western powers trying to rein in Tehran's galloping nuclear drive. Ahmadinejad did not set a deadline for the increase. But his announcement is likely to shake up his skeptics in the West, amid efforts to get Iran to accept a draft deal, backed by the United Nations, to send its low-enriched uranium abroad to be enriched for use at a medical research reactor in Tehran. 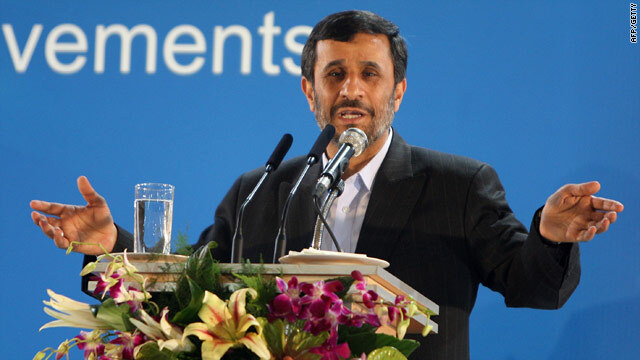 "The doors for interaction are still open," Ahmadinejad said at a ceremony marking Iran's laser technology achievements. "We had told [the West] to come and have a swap, although we could produce the 20-percent-enriched fuel ourselves." The Islamic republic had until the end of 2009 to accept the deal offered by the "P5 plus 1," which consists of permanent U.N. Security Council members Britain, China, France, Russia and the United States, plus Germany. Instead, Iran came back with a counteroffer, giving the West until the end of January to accept its own proposal. The details of that offer were never made public. Last month, Iranian Foreign Minister Manouchehr Mottaki said Iran would "officially declare" that it would produce enriched fuel at 20 percent if the West missed the deadline. Mottaki had said in December that the country was ready to send about 400 kilograms of its 3.5-percent-enriched uranium -- a third of the 1,200 kilograms spelled out in the P5-plus-1 deal -- and receive 20-percent-enriched fuel in exchange. Iran's leadership has signaled concerns about whether the West would hold up its end of the bargain by returning the enriched fuel. In the speech broadcast Sunday on Iranian state television, Ahmadinejad added that Ali Akbar Salehi, director of the Atomic Energy Organization of Iran, has been told "the door to the exchange of fuel is open but they must start the production of 20-percent-enriched fuel." And on Friday, Mottaki said he believes a solution will be reached over the proposed deal to export uranium for enrichment abroad, a demand of Western nations who worry that Tehran plans to use its program to build nuclear weapons. "The amount of uranium [for export] is negotiable. But I am confident that a solution can be found," Mottaki said on the sidelines of the Munich Security Conference in Germany, Iran's state-run Press TV reported. The West fears Iran could use the enriched uranium to produce an atomic bomb, while Iran -- a major oil producer -- insists its nuclear program is intended solely for peaceful purposes. "If the international community will stand together and bring pressure to bear on the Iranian government, I believe there is still time for sanctions and pressure to work, but we must all work together," said U.S. Defense Secretary Robert Gates, speaking at a news conference in Italy on Sunday with his Italian counterpart, Ignazio La Russa. Meanwhile, a spokesman for the Iranian Parliament's National Security and Foreign Policy Committee said Sunday the group felt the Ahmadinejad administration was sending mixed messages about conducting domestic enrichment while still remaining open to a fuel exchange. The majority of the group supports making enrichment a domestic business. "What we must be mindful of when we speak of the exchange [of nuclear fuel] is, the positions must be in line with the frameworks that are acceptable by the system" and Iranian Supreme Leader Ayatollah Ali Khamenei, spokesman Kazem Jalali told Iran's semi-official Mehr News. "We never saw any sincerity from the 5+1 countries that would make us change our experiences vis a vis the exchange of fuel," he said. "It seems that the positions announced by the administration regarding this matter were uncoordinated words." He said lawmakers had established a two-month deadline for enrichment and "we all supported it." Sunday's announcement of the new enriched uranium plans falls within the 10-day period marking the 31st anniversary of the 1979 Islamic revolution that toppled the U.S.-backed shah. Celebrations commemorating the overthrow began last week and will culminate on February 11.